Telecom construction (or telecommunication construction) is the style or method of applying engineering, design, planning, project management, building, transportation, logistics, electrical and completion of a specific infrastructure project. These types of projects include a variety of turn-key general contracting ranging from general restoration to comprehensive electrical services to achieve a telecom solution. Let's get started exploring one particular example of these principles being applied in the field. While telecom infrastructure may vary based on scope of work, the need for turn-key construction services is key to the success or failure of any project. Our team recently completed work partnering with ImOn, a local ISP (Internet Service Provider), to help with network expansion in the Cedar Rapids/Marion area. Before any construction can get underway, a strong knowledge of engineering design and planning is required to fully understand the project requirements. Engineering Design is defined as the process of devising a system, component or process to meet desired needs. It's a decision-making process, in which the basic science and mathematics and engineering sciences are applied to convert resources optimally to meet a stated objective. In this example, a full analysis of the proposed site location was performed to determine how much physical space was needed to perform all aspects of the proposed turn-key services. The full planning process determined a number of factors had to be dealt with before beginning the pre-construction phase. This included the removal of existing concrete and landscape. Once the pre-construction and planning phase concludes, a lead Project Manager begins to map out the scope of work for the entire project from the smallest detail to the biggest obstacles. Project Management is the practice of initiating, planning, executing, controlling and closing the work of a team to achieve specific goals and meet specific success criteria at the specified time. The primary challenge is to achieve all of the project goals within the given constraints. With this project example, a procurement process was conducted to determine the exact type of telecom shelter and generator that would be required to house all of the equipment inside. In addition, details on transportation/logistics for delivery of the concrete shelter and grounding/electrical service were also carefully planned out to meet industry standards and reduce lead times. With the scope of work determined, the next important phase involves the actual preparation of the telecom site before anything can be delivered and fully built out to specification. Site Preparation is the act of grading, landscaping and building roads and siding of an area of ground where anything previously located has been cleared to make the project site free of obstruction. For this project, we utilized excavating equipment to fully prepare the landscape. This included physically removing a tree and pre-existing concrete foundations. By doing this, we were preparing the site for new concrete foundation and other needed site work. Once the site landscaping is fully prepared, getting the area mapped out for the foundation is the next critical phase before items can be delivered. In this example, our team first focused on the build out of the concrete foundation that would house the placement of the 11x20 precast concrete shelter. Additional concrete was poured for an entrance and pad for a generator. With the Project Manager having a scope of work intact, site preparation complete and foundation in place, the next important step is preparing for transportation and logistics. Logistics is the planning, execution and control of the procurement, movement and stationing of personnel, material and other resources to achieve the objectives of a campaign, plan or strategy. When it comes to telecom, this could be planning for transporting very heavy pieces of equipment such as telecom concrete shelters, generators, cabinets or fiber optic cable. In this example, our project management team evaluated all site conditions to make sure they were conducive for the weight of the crane and truck with a heavy concrete shelter on it. Once the foundation had proper time to cure, a date was picked to deliver the shelter to the site. The schedule required lots of planning in advance, including lining up the arrival of the crane at the offload site and scheduling an appropriate time for pick up where the shelter was being held. With proper planning, the job was able to remain on schedule and stay on budget. Before the completion of the project, it is necessary to determine and install all necessary electrical and grounding materials needed to power the job site. For electrical purposes, the term grounding refers to ground or earth as a reference point in an electrical circuit from which voltages are measured. This includes a common return path for an electric current or a direct physical connection to the earth. A ground wire is designed as an additional path for electrical current to return safely to the ground without danger to anyone in the event of a short circuit. In this example, all of the electrical is serving both the AC and DC side. All of the important power equipment inside the shelter is running on DC power at 48 volts, while things like the lighting and HVAC systems are running on standard AC power. 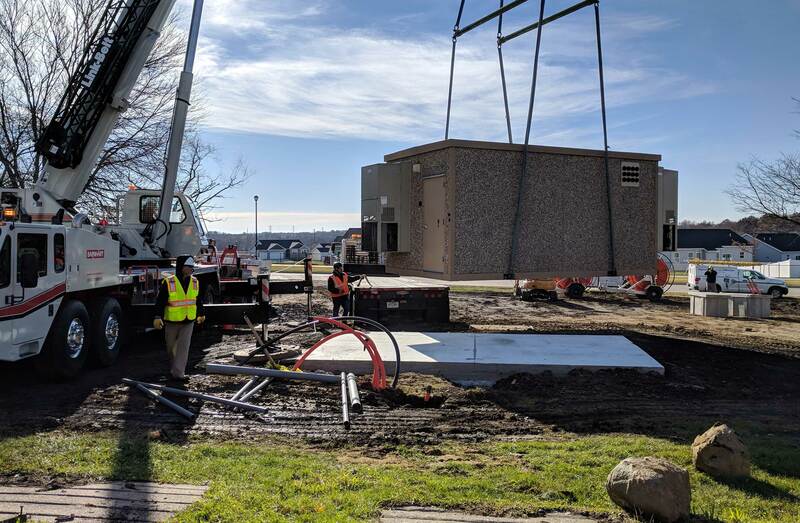 An ATS (Automatic Transfer Switch) was installed for the generator on the outside of the shelter, while a battery backup system was built to back up all DC powered equipment inside the concrete shelter. AC power was ordered from the electric company and a meter was placed on the side of the shelter to hook into the main electrical system. The ground ring was installed to anticipate any unwanted power surge or static build up at the project site. With final grading performed around the shelter, the surrounding landscape was reseeded and a rock driveway was created to provide a proper entrance to the site area. This network expansion allowed for the introduction of fast and reliable fiber optic cable, with speeds reaching up to 1 Gig (1,000Mb). Customers in the area are also avoiding bottlenecks or slowdowns during peak hours as the connection is not being shared. Check out our video below exploring this project, with comments from ImOn's Bernard Dutchik. We get it. Decisions like this can be pretty big. Our customers are under a tremendous amount of pressure to get their infrastructure projects completed quickly and reliably. Before you get in touch with us, download a free eBook version of this page to view offline.